2017 Grammy nominees album drops everywhere January 20, 2017. 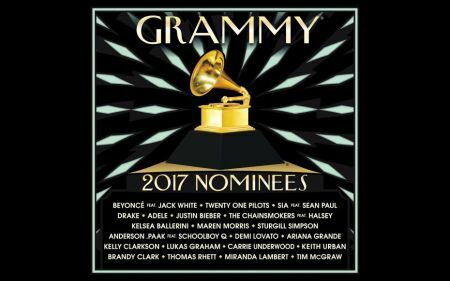 The Recording Academy has unveiled the star-studded tracklist for the 2017 Grammy nominee compilation album. From the likes of Justin Bieber to Beyonce and country outlier Sturgill Simpson, the forthcoming disc is packed with 21 hits to celebrate the past year in music. The project was curated from many of this year's major playing fields, including Album of the Year, Song/Record of the Year and Best New Artist. "The album provides a unique playlist, and showcases some of the greatest songs and talented artists that make up this year's incredible nominees," Neil Portnow, President/CEO of The Recording Academy, shares in a press statement. He adds, "We are pleased to collaborate with Atlantic Records on this project, which provides support for the invaluable programs and initiatives our charities produce throughout the year." The album (out Jan. 20). also includes Twenty One Pilots, Tim McGraw, country breakouts Kelsea Ballerini and Maren Morris, Lukas Graham, Kelly Clarkson and The Chainsmokers. Fans can now pre-order on iTunes. A portion of album proceeds benefit the MusiCares Foundation and the Grammy Museum Foundation. Chairman and COO of Atlantic Records Julie Greenwald says, "It has been a fantastic year for music, and we're very happy to partner with The Recording Academy once again to release a tremendous collection of GRAMMY-nominated artists and songs. It's great to have all these amazing and diverse performances together on one album, especially when it supports the wonderful work done by The Recording Academy's charities." The 59th annual Grammy Awards go live Feb. 12 on CBS at 8/7c. Stay tuned to AXS.com for any and all updates.